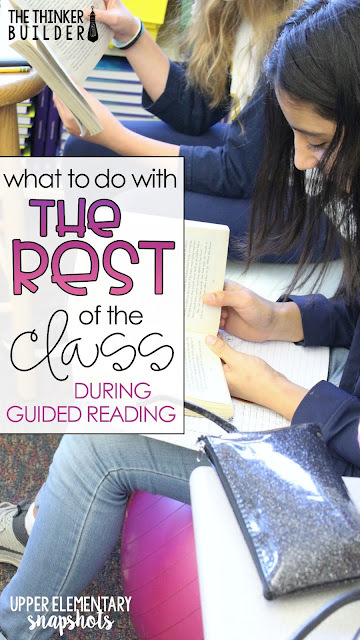 The question I get asked by teachers more than any other is what to do with "the rest" of the class during your reading block, while you are meeting with small groups or holding one-to-one conferences. 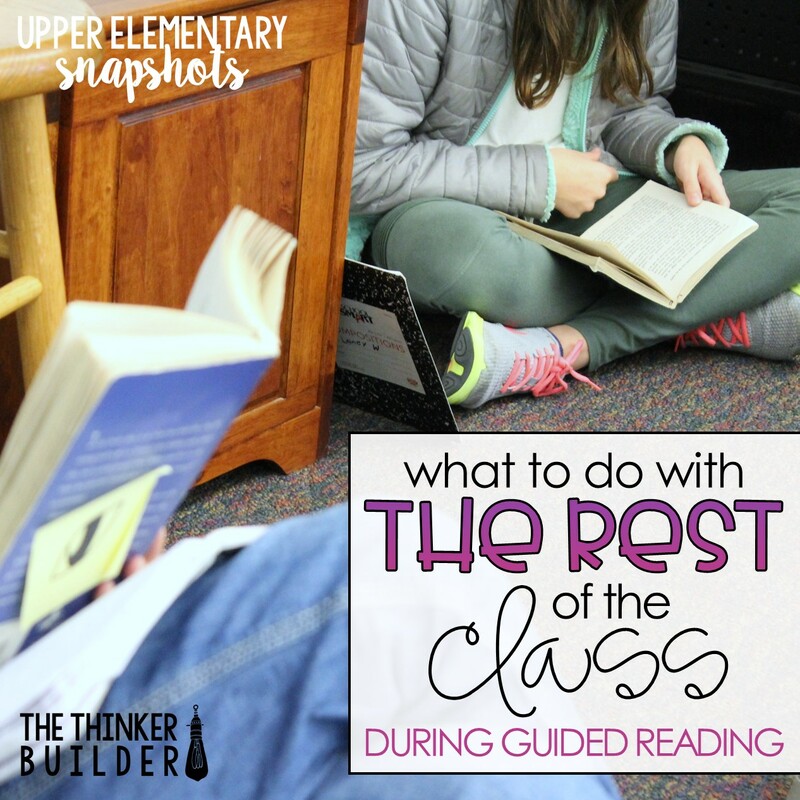 Over on my blog, The Thinker Builder, I've written a lot about creating a literacy block schedule, organizing and managing small groups and tracking students' reading progress, so I wanted to take some time to focus on the rest of the class. Because, as you know, the most amazing small group lesson you have planned will fail if "the rest" of your students are disengaged and disruptive. I don't intend to be all-encompassing about your options, because, well, there is plenty of stuff out there that doesn't meet my essential criteria. But there is plenty that does, and it can be difficult to choose a system that jives with your particular group of students and with your own style. Since we need a way to organize our options, I've chosen to zero in on two key factors: framework and tasks. I'm focusing on two frameworks, one more structured and one less structured. A rotation framework is more structured, where the block of time is broken into chunks. When you as the teacher meet with your first group of students, the rest of the class is involved in their first rotation. When you transition to your second group of students, the rest of the class transitions to their second rotation, and so on. A workshop framework is less structured, where students are given a span of time within which to work on tasks. When you as the teacher meet with a particular group of students, the rest of the class does not necessarily need to transition to another task. And I'm categorizing student tasks into two main types: one more controlled in which student tasks are assigned by the teacher; and one less controlled in which tasks are chosen by students. We could sort tasks in a number of other ways, like independent/partner/small group tasks, reading/writing/word study tasks, or one-sitting/week-long/never-really-finish tasks. But for now, let's stick with assigned tasks and chosen tasks. Let's look at each combination created from our two frameworks and two task types. Our tasks are represented on the x-axis, and our frameworks are represented on the y-axis, with the most structure and control in the lower-left quadrant, and the least structure and control in the upper-right quadrant. 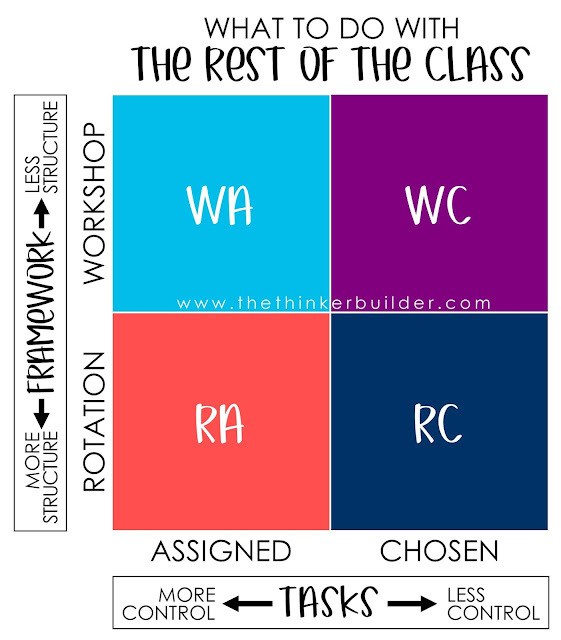 Now we'll zero in on each quadrant to look at what each one might look like in the classroom. In this combination, you have a set number of rotations each day, and students rotate at the same time to different assigned tasks. 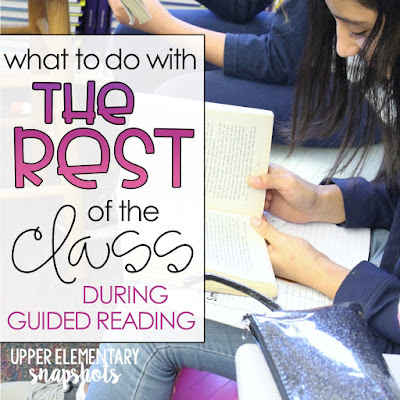 During the first rotation, you meet with a small group of students, and the rest of the class works on an assigned task, often in the form of a station or center. (Students may or may not be working on the same task at the same time.) When you transition to a second small group of students, the rest of the class transitions to a different assigned task, and so on. 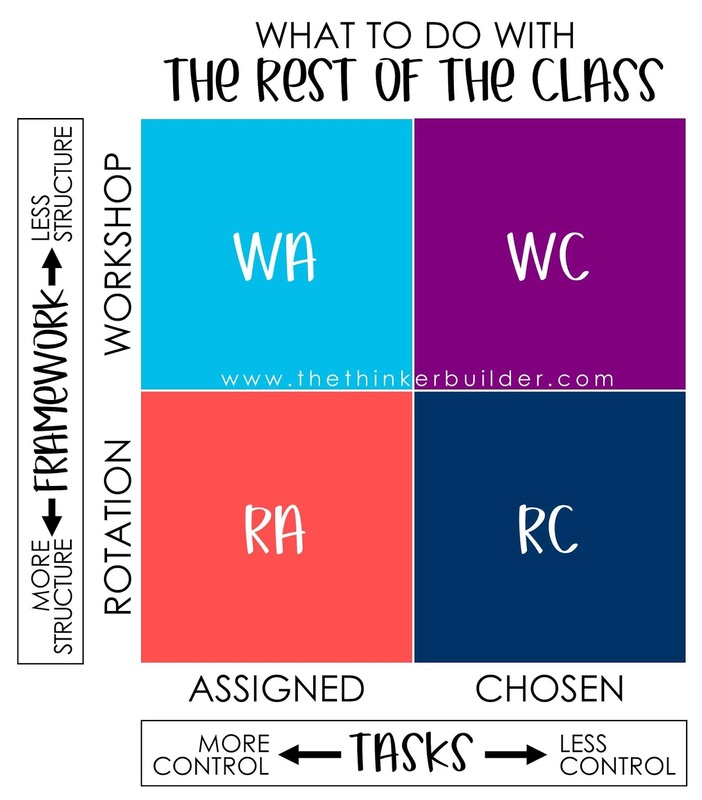 On a day with three rotations, for instance, students work on three different assigned tasks, unless they meet with you during a rotation, which means they would have two different assigned tasks. In this combination, you have a set number of rotations each day, and students rotate at the same time, but students have a choice in which task they rotate to. These choices might be made on the spot, when it's time to rotate, but more likely these choices are made at the beginning of the day or week, chosen from a list of possible tasks that have already been introduced and modeled. In this combination, you have a span of time in which you meet with small groups. Because the rest of the class need not change tasks when you change groups, you have more flexibility with the groups you meet with and for how long you meet with them. Meanwhile, students (who aren't currently in a group with you) work on assigned tasks, be it one or several. You might give a set list of tasks to complete during the workshop time, or you might give a set list of tasks to complete within the week. In this combination, you have a span of time in which you meet with small groups and/or individuals. Meanwhile, the students not meeting with you have chosen tasks on which to work. The options available to students are known and understood, and students most likely have made their choices beforehand. Though it's nicely organized to separate the four systems above in isolated quadrants, it's much more realistic to consider hybrid versions. You might have all students working/reading in small groups simultaneously, and you rotate to different groups to facilitate or teach. Or maybe you have certain small groups you want to meet with in a day, but the points at which students change tasks are flexible and don't necessarily line up with you transitioning to a new group. You might assign the tasks but students can choose the order in which they do them. Or maybe you have certain tasks students must do first, and then proceed to chosen tasks thereafter. Or you might separate types of tasks into groups and students must choose a certain number of tasks from each group. Okay, so we've laid down some heavy groundwork. Are you ready to get into exactly what your "system" might look like, how you will manage it, and what specific tasks the rest of your students will be doing? I answer all of these questions in THIS POST on my blog. We get into lots of the nitty-gritty, including example frameworks and tasks (and all the thinking behind them), as well as several clear, organized methods for students to select, start, and be held accountable for those tasks, including FREE, editable forms and PowerPoint slides to get you rolling.